• The 3 back panels are compressed neoprene, your hood should not be getting thinner as you go deeper! • There are no seams in the middle of the seam to cause jaw fatique. • SEASOFT uses 4 different types of neoprene to make this hood, others use one or two. • There are two tiny holes in the top of the hood with a baffle system to allow air to purge. • There is "skin in" on the neck to bind to your drysuit seal. • High quality neoprene is used throughout on every hood. Why should you buy this SEASOFT Ti PRO™ 6 mm Drysuit Hood? The short answer is that this hood is more comfortable and warmer than any other hood made by any other company but here's why it is. FACT: The head is responsible for the greatest heat loss while diving, up to 35%. FACT: Other hoods use neoprene that contains lots of air bubbles, the claim being they are comfortable. However, lots of bubbles create a hood that easily compresses while diving – good-bye thermal protection! The neoprene is getting thinner just when you need it the most! FACT: Many divers get cold thinking it’s their wetsuit or drysuit making them cold when it’s the lack of a warm hood. SOLUTION: SEASOFT uses compressed neoprene in the three back panels for unsurpassed warmth. SEASOFT Hoods do NOT get thinner at depth; they keep you warm and toasty throughout your dive. FACT: Most companies cookie cut their hoods, the left side could be the right side, there is a seam right down the middle of the chin which causes jaw fatigue. 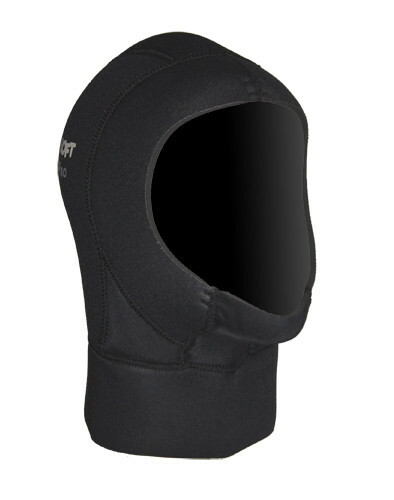 SOLUTION: All SEASOFT Hoods are designed and manufactured without seams in the middle of the chin. Other companies build hoods with this seam because it is less expensive to manufacture them this way. FACT: Most companies use one type of neoprene and occasionally two to make their hoods, this keeps costs low. SOLUTION: SEASOFT never uses less than 4 types of neoprene to make its hoods because each part of the hood is performing a different function. You deserve to be warm AND comfortable! ALL SEASOFT Hoods have two layers of Titanium Flake Foil Technology™ for extra warmth. So there are the facts, SEASOFT has invested in the engineering to bring you the Ti PRO™ 6 mm Drysuit Hood that is unsurpassed in performance, all you have to do is get one for yourself.